The two hospital groups are discussing a range of possibilities to serve heart failure patients after the implosion of Oregon Health & Science University’s heart transplant program. Providence’s leading heart failure specialist, Dr. Jacob Abraham, is a busy man. He sees patients and conducts research, recently helped oversee a clinical trial of a device that repairs a heart valve, increasing the life and survival rates of patients with few options. And he's expanding his department to meet the needs of hundreds of Oregon Health & Science University. The two facilities are working together to help patients caught in the middle of the collapse of OHSU's heart transplant unit. "Everything's on the table," Abraham said after a recent press conference about the MitraClip, a device that looks a bit like a butterfly screw that repairs the mitral valve in heart failure patients. The device is considered revolutionary. One thing that's for sure: Abraham has the go-ahead to hire another heart failure specialist. But finding one and bringing them onboard will not happen quickly. There are only about 1,000 of these board-certified physicians in the country. “That process takes time because we want to recruit the best people,” Abraham said. Providence needs another cardiologist to handle hundreds of heart failure patients from Oregon Health & Science University who are being transferred from OHSU. All four of the heart failure cardiologists on OHSU's heart transplant team have left the university or will be gone by the end of the month. A acute care nurse practitioner has also moved. The first heart failure cardiologist to go, Dr. Jill Gelow, is now at Providence. Abraham said Gelow, who’s located in Hood River, is seeing clients there and at Providence Portland Medical Center in Northeast Portland. “Many of the patients at OHSU know her and are being scheduled to see her,” Abraham said. The other cardiologists on Abraham’s team -- there are five including him -- are also making room in their schedules. He said the change is not just an adjustment for Providence but also difficult for patients. “Anytime you establish a relationship with a team of doctors and then suddenly have to shift your care regardless of how excellent the new team may be, there’s unfamiliarity and you have to establish trust with that team,” Abraham said. He expects Providence to take on about 400 OHSU patients. About 175 already have been scheduled for appointments at Providence Portland Medical Center, he said. Providence won’t be performing transplants -- OHSU had the only program in the state -- but its cardiologists are highly skilled in implanting high-tech devices like the MitraClip that keep heart failure patients alive. All of OHSU’s patients with a heart assist device -- there are about 50 in all -- are being booked for appointments at Providence St. Vincent, which has the expertise and equipment to help them. Abraham said OHSU and Providence are working closely on the transfers. But that might not be the end of the story. Abraham has been talking to Dr. James Mudd, the leader of OHSU’s heart transplant unit, who is leaving at the end of this month. Mudd and Abraham trained together in medical school at the Johns Hopkins University School of Medicine. Both are rock stars in their field and live in the Portland area. They have tight schedules but keep in touch through conferences. It does not seem likely that Mudd would move to Providence to work under Abraham but the two are talking about ways to collaborate. Providence officials also have raised the possibility of restarting a heart transplant program though nothing’s been decided. He said the best solution could be a joint program between the two facilities. 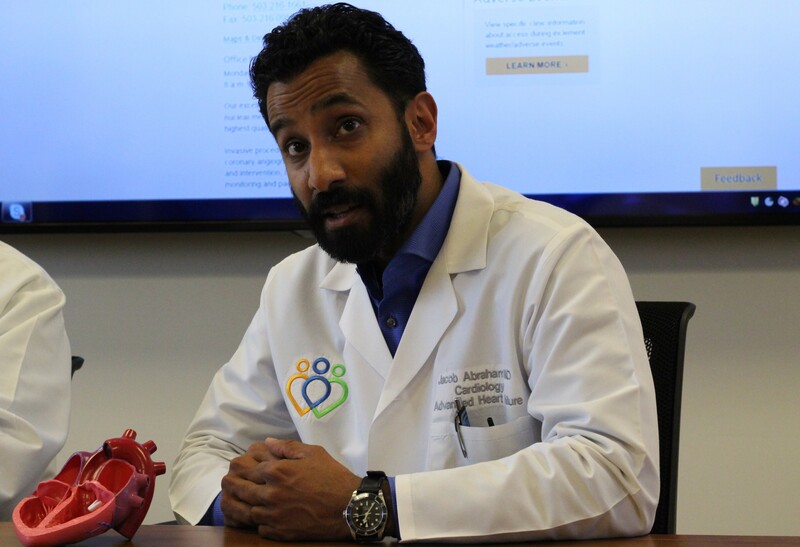 “I think all options are really on the table as we move forward and advance heart care for these patients,” Abraham said. He declined to specify what any collaboration would look like but recognized that the change is difficult.